Head of careers, alumni, and corporate relations at EU Business School (EU), Anna Wlodek is responsible for a 26,000-strong alumni network, spanning over 50 countries—including Spain, Germany, Switzerland, Russia, the US, and India. With such a strong international base, and a large network of professionals to tap into, it is no surprise that world-renowned companies like PwC, Unilever, and L’Oréal are hiring EU Business School graduates today. According to Anna, these companies seek recruits with a strong international profile—multilingual candidates with cross-cultural and local knowledge—with strong communication skills, a proactive nature, motivation, and self-drive. To hone these skills, on the MBA in International Business program at EU’s Geneva campus—the school also has campuses in Barcelona, Montreux, Munich and Online—students take seminars in negotiation and communication skills. There is also a dedicated personal and professional development module that runs throughout. Gaston Garcia Blasco, who graduated from EU with an MBA in International Business, provides the perfect example of how learning these skills can help individuals to excel in their careers. Gaston now works in marketing and communications for his family’s corporate hospitality business in Barcelona. He says that the general atmosphere at EU is focused on developing communication skills—students are actively encouraged to work together during presentations and group assignments that run throughout the program. As an international hub for business, studying an MBA in Geneva means EU students have plenty of opportunities to network with peers from all over the world. “It really helps because in the future, say if you want to open a business in Russia, or Kazakhstan for example, you have those contacts,” Gaston explains. Originally, Gaston was drawn to the MBA at EU Business School thanks to Geneva’s international appeal. He was actively seeking job opportunities in the sports event industry, and he went on to work as a match operations specialist for UEFA in Switzerland straight after his degree. But since getting involved with his family’s business, he has been experiencing the benefits of the many networking opportunities he enjoyed during his studies at EU. 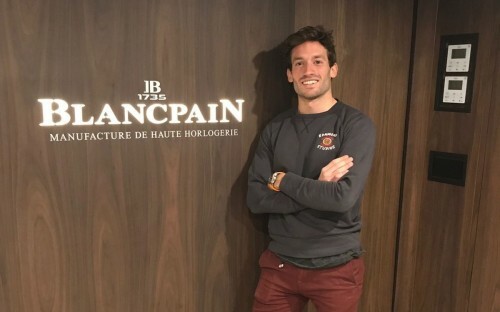 “I went to Baselworld—the world’s leading event for the watch and jewellery industry—during my MBA, where I met a lot of [CEOs and high-end business people],” Gaston says. Giving students the chance to attend events like Baselworld opens their eyes to multiple markets, as they network with professionals from a plethora of companies. As in Gaston’s case, tapping into this network has proved invaluable since graduating. He explains that by being immersed in a global classroom at EU Business School, collaborating with peers from all over the globe, his soft skill development was harnessed in an international context which stands him in good stead when trying to land international clients for his family’s business. “The MBA in Geneva is super international, and the network is brilliant,” he concludes. “If you are looking to [tap] into a different market—finance, luxury, or sport—it’s a great place to be.